Round 2 of the 2014 NHL Stanley Cup playoffs was a barn burner all-round. Every series felt like a legitimate rivalry even though some of these teams, like the Anaheim Ducks and the LA Kings, had never met in the playoffs before. Here’s the best and worst of it. Original Six. Longstanding rivals. Good versus evil. These games had everything – the good (Carey Price and PK Subban’s performances), the bad (Thornton spraying Subban with water mid-play), and the ugly (the racist rantings of some Bruins fans). In the end, the intensity elevated the Habs play and seemed to throw the Bruins off their game with their big lines doing much of nothing. This was bad because for some reason, after being up 3-1 in the series, the Pittsburgh Penguins checked out. For me, the best series are battle right to the end, and this is the only series that wasn’t that. Sidney Crosby, Evgeni Malkin, James Neal, Chris Kunitz and all that undeniable talent were deniable after Game 3. This can’t be laid on their goalie this time. It was disappointing to watch therefore, worst series. 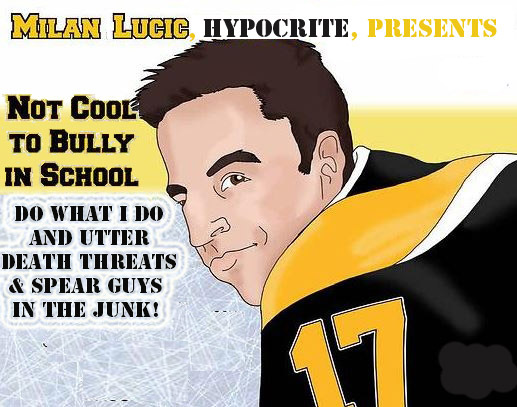 Lucic wins this award not because his team lost, but because of the way HE lost. His childish, unsportsmanlike antics – spearing guys, being a sore winner taunting the Habs when Bruins won, death threats in the handshake line – make him not just the biggest loser of Round 2 but a life loser in general. Lucic, I’m embarrassed that you’re from Vancouver and even from Canada. You have a lot of growing up to do, punk. I didn’t like this guy until this series. Sure, I never disputed his talent, but I thought he was an overemotional, hot-headed punk. Not anymore. I don’t know exactly when PK Subban became a poised, confident player but the change was noticeable this series again Boston. 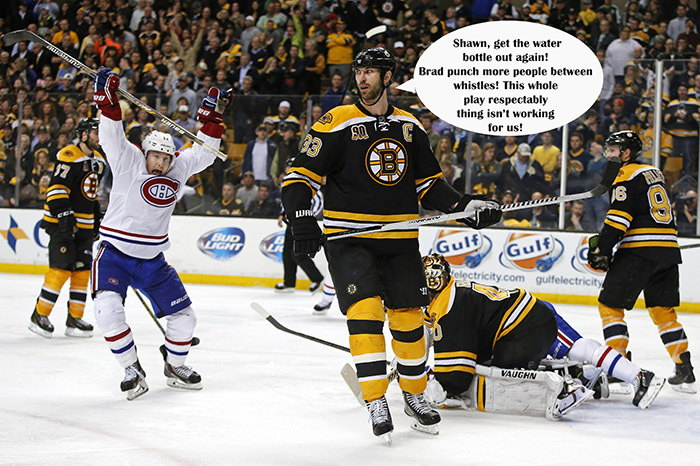 PK didn’t let the racist taunts, the bully antics of Thornton or the death threats of Lucic throw him off his game. He didn’t escalate it in the media when he honestly had every right to. Instead, he seemed to channel it into improving his already stellar play. His offensive defence was a major factor in the Habs nabbing the series. Blondes aren’t known for thick beards, but Carter grows a Grizzly Adams one in the blink of an eye. And it’s got ginger in it, which is hot. The man is already talented and gorgeous, the thick, full beard just adds to it. Now if only he had more teeth… thanks Duncan Keith. Speaking of ginger – Kane’s seems super orange this year. Like he used Sun-In or something. And, yay, it’s fuller than previous years but it’s an unkempt mess. And then there’s the mullet… shudder.